Recently, as I worked with my daughter on her math homework, I was reminded of the beginnings of her math journey. There are lots of methods for teaching young children about counting and math. As with most things, reading books was my favorite way. The Very Hungry Caterpillar by Eric Carle is a classic that engages very young children through its unusual presentation and includes counting 1-5 (though with no digits shown) along with going through days of the week. 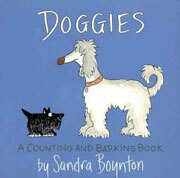 Sandra Boynton’s board book Doggies was one of my favorite counting books, along with her One, Two, Three and Hippos Go Berserk* (which includes counting back down to one). Her quirky humor works well in these. Miss Spider’s Tea Party by David Kirk was one of the first books my daughter loved to read. A bonus, it breaks an unwritten rule and progresses past 10 to 12. Ten Terrible Dinosaurs countdown book by Paul Stickland used to elicit some giggles as bad behavior whittles down the group. Deep in the Swamp mesmorized my children. Colorful descriptions and rhythmic language used in Donna Bateman’s take on the “Over in the Meadow” songs merge well with Brian Lies’ beautiful images of animal babies in their habitat. I’m Dirty by Kate and Jim McMullan, as mentioned in a previous article, is one of my son’s favorites. Here children are invited to count the garbage in the heaps dozed away from “10 torn-up truck tires” to “”1 wonky washing machine”. Richard Scarry’s Best Counting Book Ever is a visual treat for kids encouraging counting, basic math and the concepts of counting by groups. Forget about counting past ten, this is the only one I could find that took them to 100. Now that we counted to 100, how about a trillion? David M. Schwartz’s How Much is a Million? explains the concept of gigantic numbers. No, it doesn’t actually count up to a trillion, since according to Schwartz that “would take you almost 200,000 years.” But it does illustrate 100,000 tiny stars on 7 pages and explain that if you went over those pages 10 times, that would be what 1 million looked like. The concepts are a bit hard to grasp, but fun illustrations by the fantastic Stephen Kellogg help make the attempt entertaining. Equal Shmequal* is a cute story by Virginia Kroll that takes on the concept of what is equal. It also encourages problem solving and fairness. 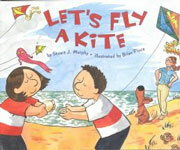 Stuart J. Murphy has some good early Math books including –Let’s Fly a Kite (symmetry) and Beep beep, vroom vroom! * (patterns). As always, if you have any favorites to share please post below. If you have any questions for me, feel free to e-mail becmelo@yahoo.com. *These books aren’t in the children’s room collection but are available through interlibrary loan. A digital version of Equal Shmequal is also available for download.